Antique - Plant Tuscan China, Art Deco, Trio Tea Setting, Made in England from 1920 thru 1936 - Three (3) Pieces. Although this Beautiful Plant Tuscan China, Trio Tea Setting, has an Unknown Pattern Name,, it is from the Art Deco Period. A Lovely Hand Enameled Cup, Saucer and Dessert Plate. The Pattern is Red, Orange, Lavender, Purple Flowers, with Green and Tan Leaves, on a Fantastic Bright White Background. Also has a beautiful "Mint Green" Band on outside of Plate Lips. Rims of Plates are a Darker Green, and also have a 22kt Gold Verge, and are also Scalloped. Obviously well cared for over the years, being in great condition. 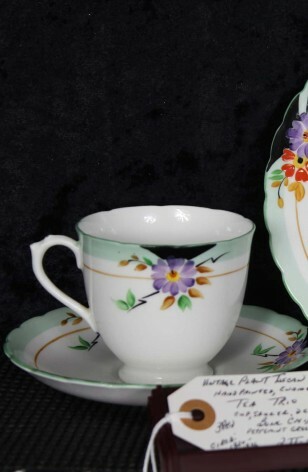 Although this Beautiful Plant Tuscan China, Trio Tea Setting, has an Unknown Pattern Name,, it is from the Art Deco Period. A Lovely Hand Enameled Cup, Saucer and Dessert Plate. The Pattern is Red, Orange, Lavender, Purple Flowers, with Green and Tan Leaves, on a Fantastic Bright White Background. Also has a beautiful "Mint Green" Band on outside of Plate Lips. Rims of Plates are a Darker Green, and also have a 22kt Gold Verge, and are also Scalloped. Obviously well cared for over the years, being in Very Good Resale Condition unless noted below of in pictures. 1 - Dessert/Bread/Tea Plate - 6 7/8"